Sand Heat Baths There is 1 product. LABEC offer Electrical Sand Baths with variable wattage control. 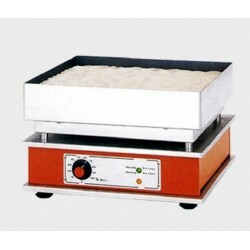 Robust construction for continuous performance with aluminium alloy hot plate. Due to the asymmetrical, long-term heating system (hot plate corners and edges are subjected to more heat) an even temperature is guaranteed over the entire heating surface.